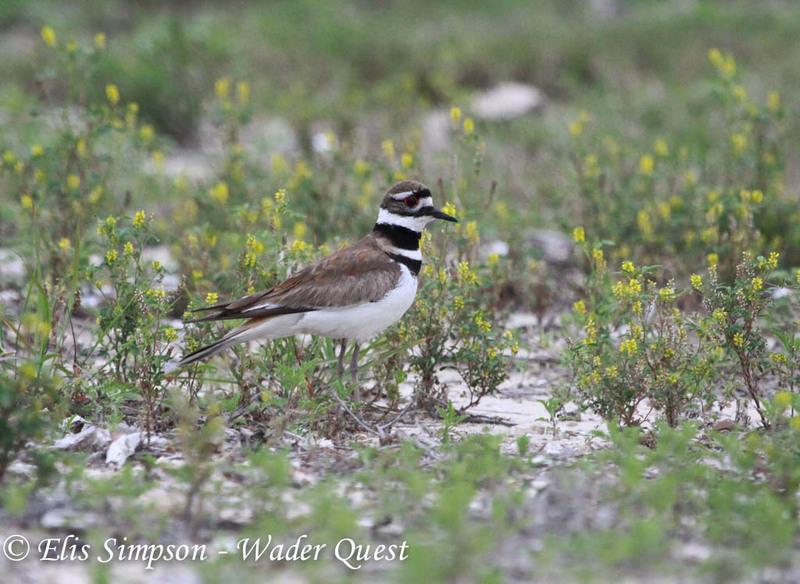 Wader Quest: Return to Galveston Texas. First thing we went to the East Jetty to check out a report that an American Oystercatcher had been seen loafing in among the many Black Skimmers that spend much time sitting on the beach and sandbank. Unfortunately the covered look-out point didn't afford us much cover as there was a strong wind coming in off the sea so the rain was coming in almost horizontally. Try as we might we couldn't locate this bird and as the weather was so atrocious we decided to head for a back-up site, the one we missed on the way in to Louisiana by the Sabine Bridge. In the car park before leaving we saw a Killdeer with its chicks which were really hard to spot and we had to take care when driving out so as not to run over them. See what I mean? 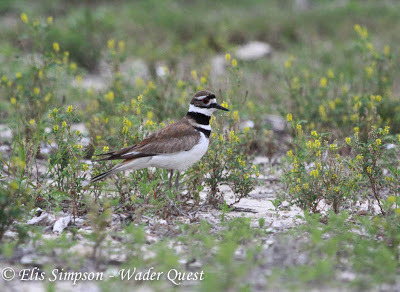 There's a Killdeer chick in this photo somewhere! When we got to the bridge the weather had changed completely it was now sunny and warm with hardly any breeze. Our instructions, kindly sent by Paul Lehman told us to park 16.8 miles from the road to Peveto Woods. At exactly 16.8 miles we stopped, I lifted my bins while still in the car and saw 2 American Oystercatchers. The heat haze made the photos pretty bad, but there was a record at least. From here we headed back to Galveston and spent the dying hours on the beach at the west end of the island happily photographing and filming the waders there.